APRILIA V4 DAYS: LEON HASLAM AND JORDI TORRES CHRISTEN THE NEW APRILIA RSV4 AND TUONO 1100. LEON HASLAM AND JORDI TORRES ARE READY TO TAKE ON THE DEMANDING ASSEN CIRCUIT: “IT’S A TRACK I LIKE”, SAYS THE BRITISH RIDER. “A COMPLETELY DIFFERENT TRACK THAN ARAGON, BUT SUITED TO MY RIDING STYLE” SAID THE SPANIARD. 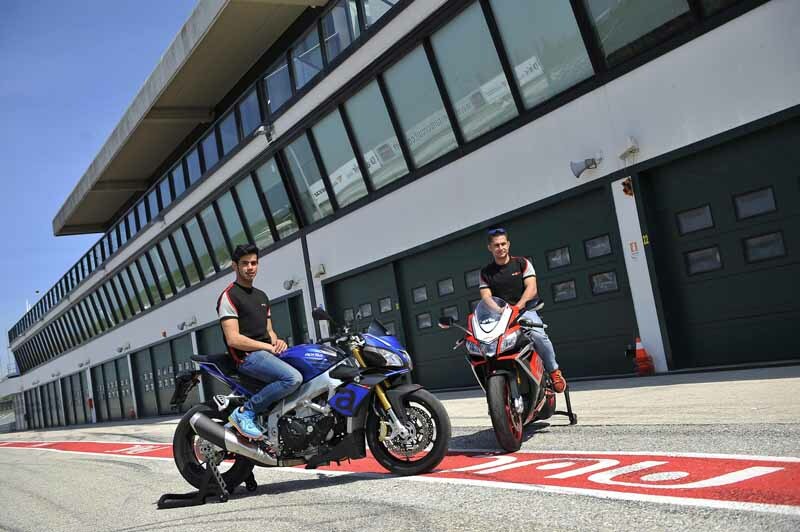 Misano Adriatico, 15 April 2015 – Special guest testimonials are at Misano Adriatico for the V4 Days where Aprilia is introducing the brand new RSV4 RF and RR and the Tuono 1100 Factory e RR to the international press and customers. Leon Haslam and Jordi Torres, Aprilia Racing Team – Red Devils standard bearers in the World Superbike championship, made a stop at the Misano World Circuit to christen the brand new V4 street bikes from Noale. On their way back from Aragon and just twenty-four hours from departing for Assen, the British rider and his Spanish colleague found themselves in the spotlight for a technical briefing before the participating journalists got onto the track and then commented on the progress in WSBK after the first three rounds. The new Aprilia RSV4 introduced over the last few days at Misano Adriatico – a track where the RSV4 has taken 4 wins and 4 podiums in the last five seasons – represents the most important and profound evolution ever achieved on this extraordinary model that has one 7 world titles in just 5 years of participation in WSBK, adding 54 championship wreaths to the Aprilia trophy case. The main goals of the new V4 project are clear: increase power across the board, exceeding the threshold of 200 HP maximum peak and at the same time increase the already generous torque at all engine speeds.